Even before the time of Christ, evergreen trees had a special meaning for people in the winter. In many countries it was believed that evergreens would keep away witches, ghosts, evil spirits, and illness. The Romans treated the solstice as more of a celebration by holding a feast called the Saturnalia in honor of the god of agriculture, Saturn. The Romans looked ahead toward spring, knowing that soon everything would be green and thriving once more. 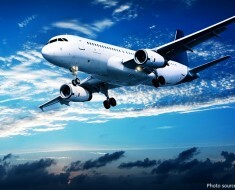 They would celebrate the coming of spring by decorating their homes with evergreen boughs. In Northern Europe the mysterious Druids, the priests of the ancient Celts, also decorated their temples with evergreen boughs as a symbol of everlasting life. The fierce Vikings in Scandinavia thought that evergreens were the special plant of the sun god, Balder. 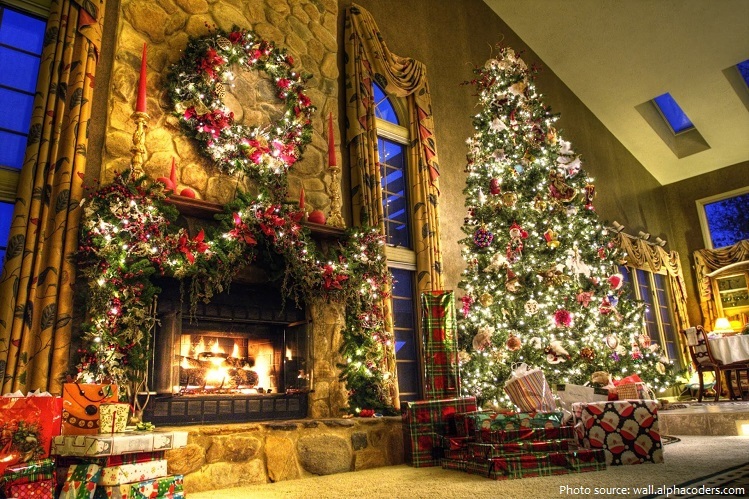 Modern Christmas trees originated during the Renaissance of early modern Germany. 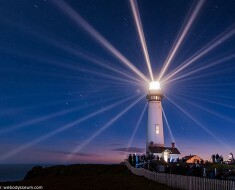 Its 16th-century origins are sometimes associated with Protestant Christian reformer Martin Luther who is said to have first added lighted candles to an evergreen tree. However, the first written record of a decorated Christmas Tree comes from Riga, Latvia in year 1510. Men of the local merchants’ guild decorated a tree with artificial roses, danced around it in the marketplace and then set fire to it. The rose was used for many year and is considered to be a symbol for the Virgin Mary. (slightly over 1.2 meters or 4 feet). The tree was traditionally decorated with “roses made of colored paper, apples, wafers, tinsel and sweetmeats”, with the apples and round ornaments representing the fruit of knowledge of good and evil from the Book of Genesis in the Christian Bible. 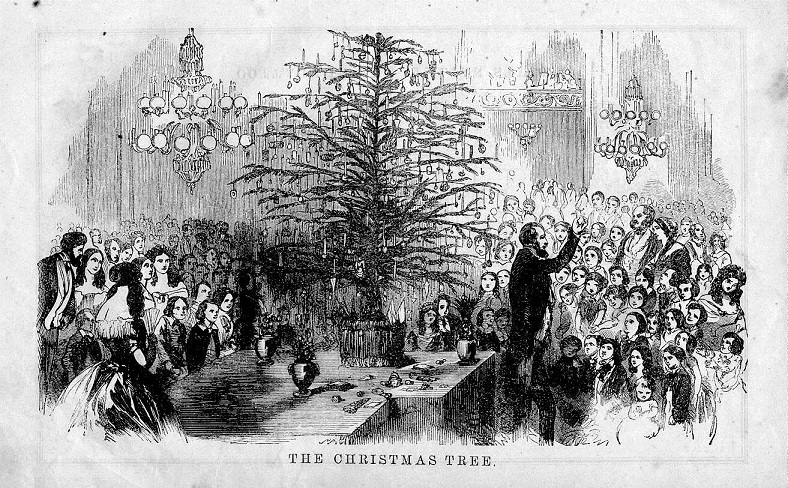 Introduced into England in the early 19th century, the Christmas tree was popularized in the mid-19th century by German Prince Albert, husband of Queen Victoria. The Victorian tree was decorated with toys and small gifts, candles, candies, popcorn strings, and fancy cakes hung from the branches by ribbon and by paper chains. Taken to North America by German settlers as early as the 17th century, Christmas trees were the height of fashion by the 19th century. By the 1890s Christmas ornaments were arriving from Germany and Christmas tree popularity was on the rise around the U.S. 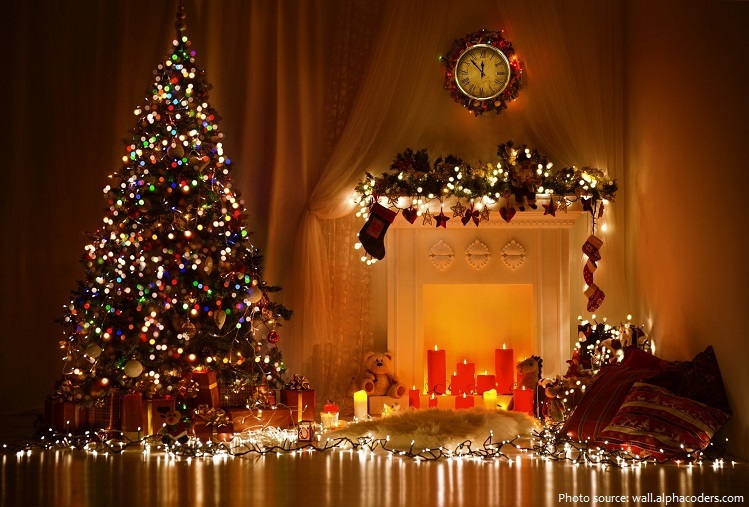 It was noted that Europeans used small trees about 1.2 meters (4 feet) in height, while Americans liked their Christmas trees to reach from floor to ceiling. 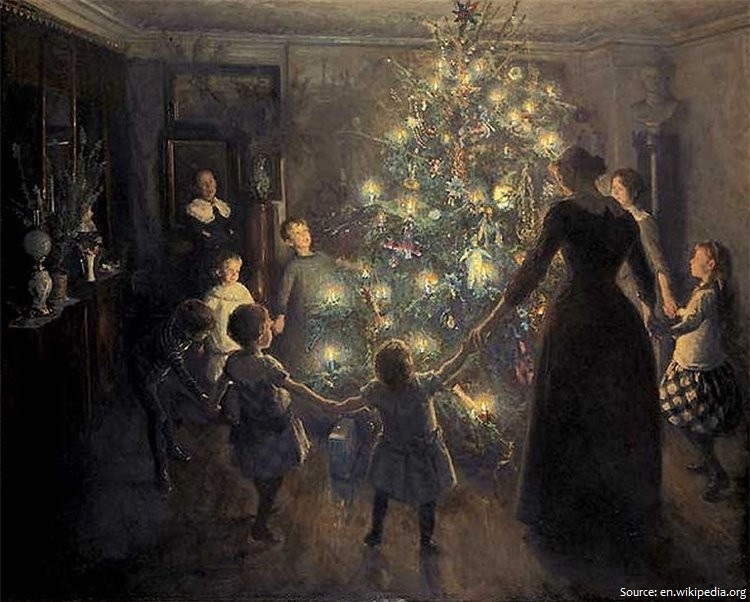 The early 20th century saw Americans decorating their trees mainly with homemade ornaments, while the German-American sect continued to use apples, nuts, and sweetmeats. Popcorn joined in after being dyed bright colors and interlaced with berries and nuts. Electricity brought about Christmas lights, making it possible for Christmas trees to glow for days on end. With this, Christmas trees began to appear in town squares across the country and having a Christmas tree in the home became an American tradition. Today, there is a wide variety of traditional ornaments, such as garlands, baubles, tinsel, and candy canes. An angel or star might be placed at the top of the tree to represent the archangel Gabriel or the Star of Bethlehem from the Nativity. 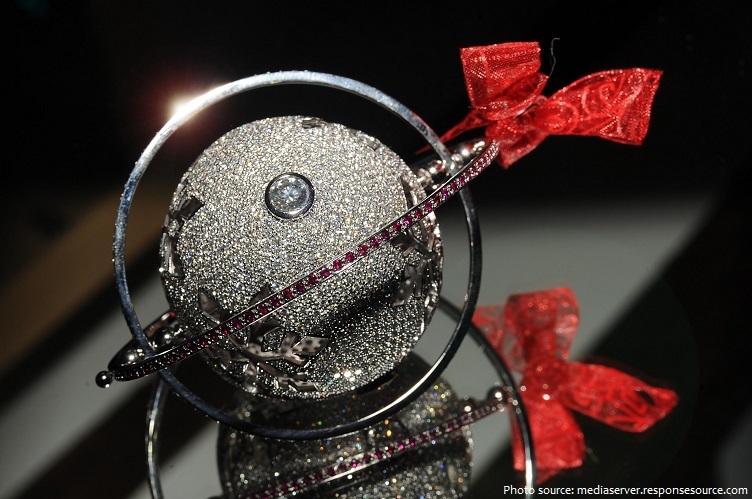 One-of-a-kind Christmas bauble hit headlines in 2009 as the world’s most expensive Christmas bauble. Made of 18 carat white gold and plastered with more than one and a half thousand diamonds, the globe shape is orbited by two rings, featuring 188 rubies. It’s been valued by the National Associations of Jewelers at $130,000 and was created by a tiny, village jewellers in Titchfield, Hampshire (UK). 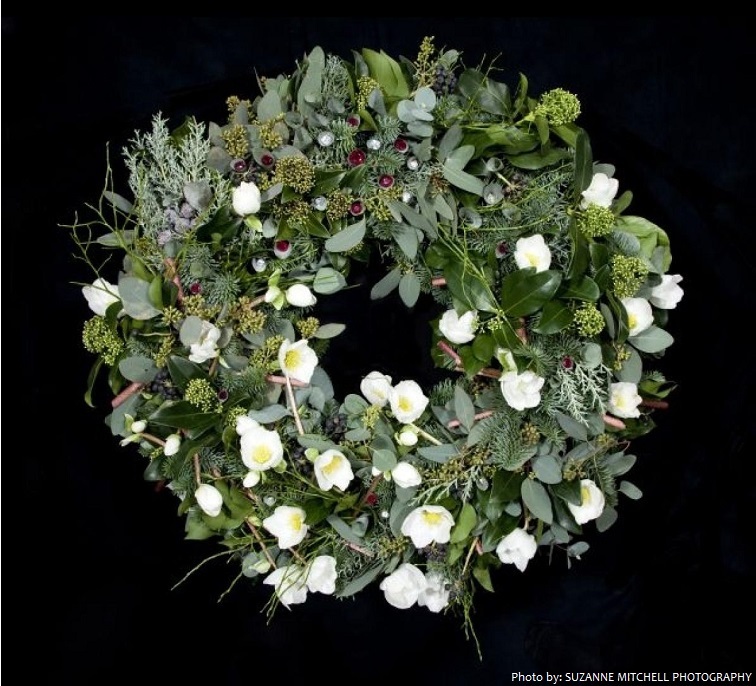 In 2013 Finnish floral designer Pasi Jokinen-Carter created what’s being called “the most expensive Christmas wreath in the world” — a $4.6 million creation that mixes some fancy holiday shrubbery with 17.49 karat rubies and a 3.03 karat fancy yellow diamonds. 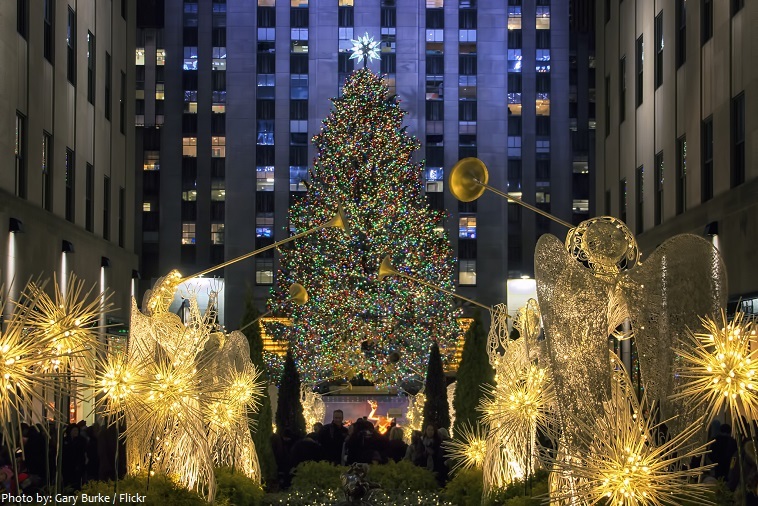 The Rockefeller Center Christmas Tree has been a national tradition each year since 1933. The tree ranges in size from 18 to 30 meters (60 to 100 feet) tall from year to year and is covered with over 50,000 LED lights. 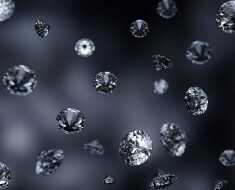 The Swarovski-crystal star that tops the tree first appeared in 2004 and is nearly 3 meters (10 feet) in diameter. The tree is positioned in front of the central feature of Rockefeller Center: the Comcast Building. 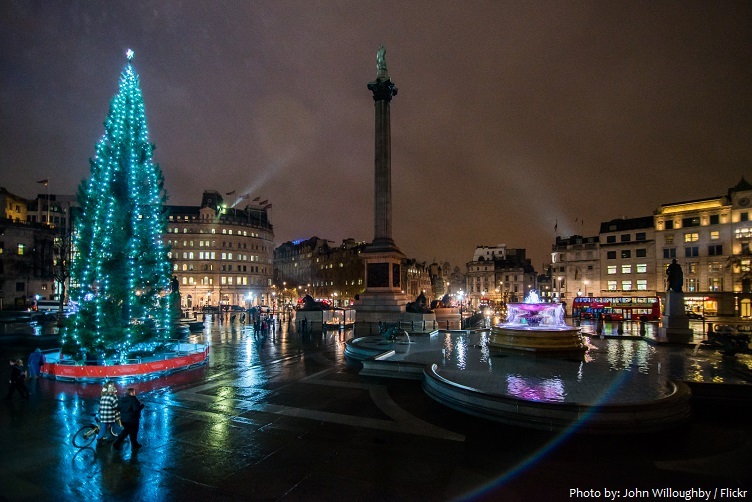 Christmas is a time for giving, and, appropriately, the huge tree in Trafalgar Square in London is a gift from Norway, which has donated one every year since 1947 as a token of gratitude for British support during World War II. The tree is a Norway spruce and is usually more than 20 meters (65 feet) tall, over 60 years old and decorated with 500 lights. The Vatican Christmas Tree, also called the Saint Peter’s Square Christmas Tree, is the decorated tree that is erected annually in the Saint Peter’s Square directly in front of St. Peter’s Basilica in the Vatican City. 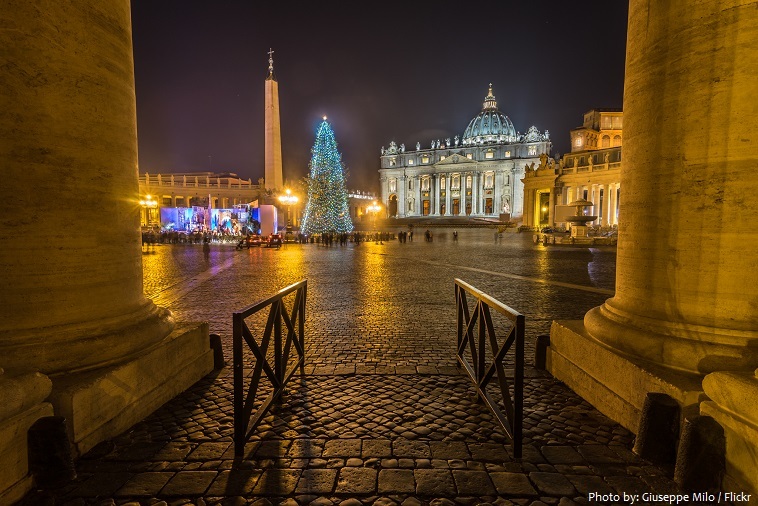 Pope John Paul II first introduced a Christmas tree in Saint Peter’s Square in 1982, and since then various European countries have donated one every year. 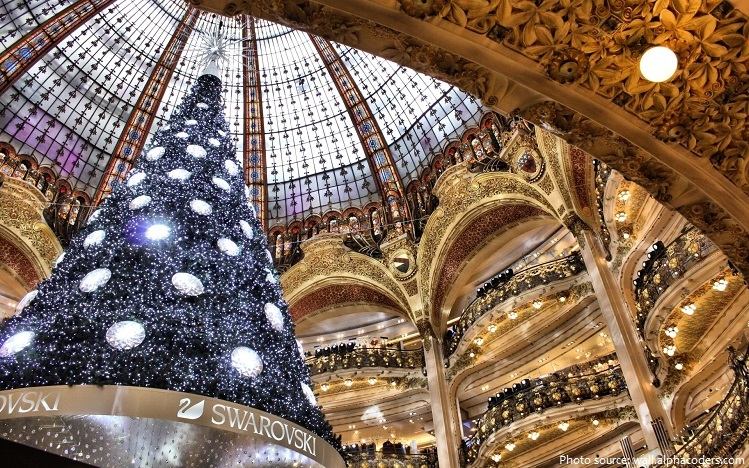 The 20-meter (65-foot) tall tree at Galeries Lafayette a luxury shopping paradise in Paris is the tallest indoor Christmas tree in the world. It’s made of metal and stands under the gallery’s beautiful dome, where each year it’s dressed with new decorations. 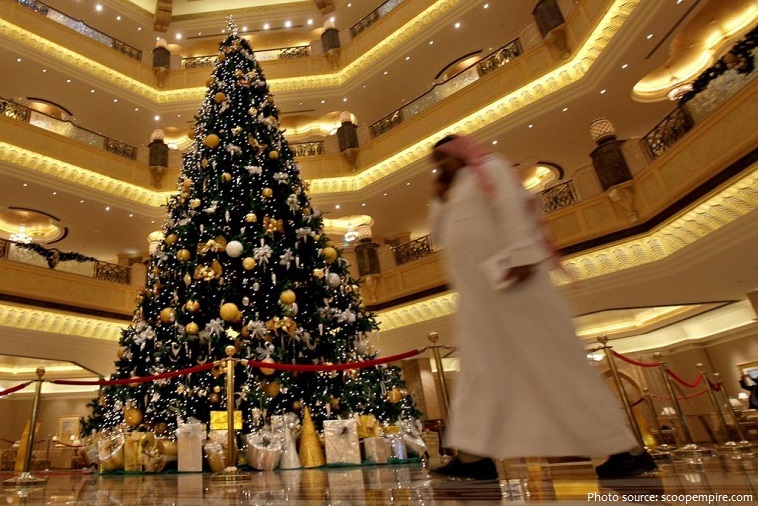 The most expensively dressed Christmas tree was valued at 41,329,531 AED ($11,026,900 US; £6,975,880), and was erected and displayed by the Emirates Palace (UAE) in Abu Dhabi, UAE, from 16 to 29 December 2010. 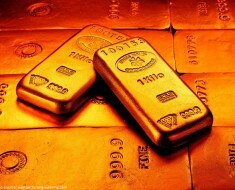 The tree was covered in 181 items of jewelry and stood 13.1 m (43.2 ft) high. The world’s tallest cut Christmas tree was a 67.36 meters (221 feet) Douglas fir erected and decorated at Northgate Shopping Center, Seattle, Washington, USA, in December 1950. Each year many families visit their local Christmas tree farm to chop down their annual tree. We bet they could have used record holder Erin Lavoie (USA) who completed the Most Christmas trees chopped in two minutes! On the set of Guinness World Records: Die GroBten Weltrekorde in Germany, the tree-chopping extraordinaire axed down an incredible 27 trees in 2008. 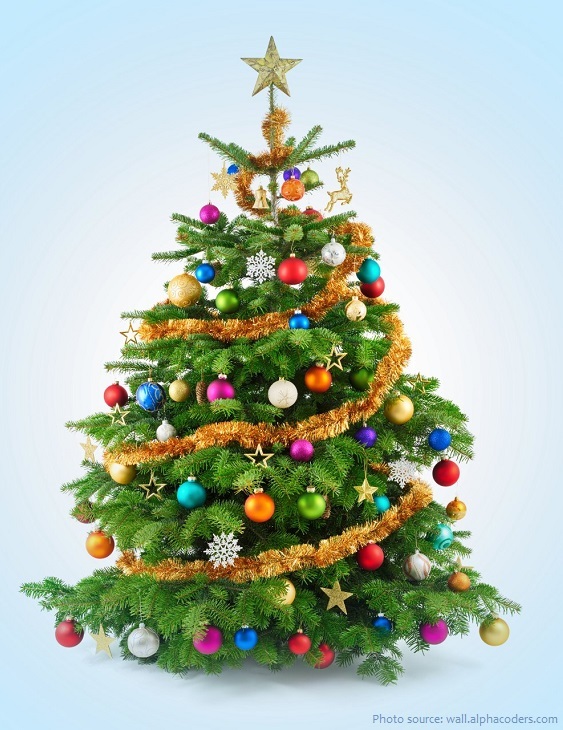 Approximately 25-30 million real Christmas trees are sold each year in the United States. Almost all of these come from Christmas tree farms. Approximately 350 million Christmas trees growing on about 15,000 Christmas tree farms in the United States. President Franklin Pierce is said to have had the first indoor Christmas tree at the White House during the 1850s, variously reported as 1853 or 1856. President Theodore Roosevelt, an avowed environmentalist, banned Christmas trees from the White House during his presidency. The president was against real Christmas trees because he feared that Christmas trees would lead to deforestation. In the 1930s, artificial trees made of brush bristles were developed in the United States, and the 1950s and 1960s saw the mass production of aluminum and PVC plastic trees. Artificial trees gained significant popularity, particularly in countries where fresh trees were hard to procure.